Des Moines is probably not the first place that one would assume has good juice and smoothie bars, we’re more known for our corn and BBQ. However, the city has a longstanding juice and smoothie bar that is local and fits the character of the Roosevelt shop area it is located in. The Juice Company has been open in Des Moines for over eight years, before the smoothie craze of recent years. The smoothie and juice industry is now experiencing a steady annual growth of 2.8%. Smoothies were considered to be a small niche market isolated to more Southern and Western parts of the country during the 1990s but now have a $2.4 billion worth market in the U.S. The Juice Company’s menu works in a couple of different ways, you can order from its selection of combination smoothies or build your own with the copious amounts of fruits and vegetables they have on the ready. Once you pick your fruits and vegetables, you have the option to customize your smoothie with non-fat frozen yogurt, dairy-less if fro yo isn’t your thing, or even make it an oatmeal smooth for more of a hefty meal replacement with Juice Company’s finely ground oatmeal. Perhaps one of my favorite things about The Juice Company are the boosts that the store gives you the option to add to your smoothie or juice, the first one is even free! 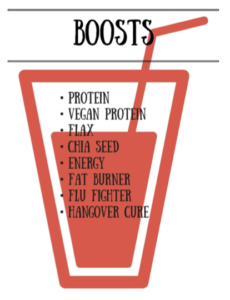 The boosts include range from popular add-ins like protein and chia seed to The Juice Company’s own creations like fat burner. Obviously, these boosts are useful and necessary for all sorts of reasons and can be mixed with one another for maximum energy and efficiency. My personal favorite Juice Company smoothie is Nutty Banana with the Energy boost. If you’re a peanut butter fan, you’ll love this one. It’s a creamy blend of fresh banana, non-fat frozen yogurt, and of course, peanut butter. Starting off a morning with one of these is sure to make your day both brighter and more productive. I highly recommend stopping by The Juice Company in the Shops at Roosevelt, across from Hubbell and Roosevelt schools on 42nd St, just right off of I-235. In case you’re not close to the metro area, The Juice Company has recently opened up a second location in the northern suburb of Des Moines, Ankeny. Owner DeWitt decided to open up a second location in Ankeny when she realized so many people were driving from out of town to the Des Moines location. The Ankeny location is on 833 E. 1st St and has the same menu as its Des Moines counterpart. “My favorite part of owning The Juice Company is the customers, they really love our selection of flavors” says DeWitt.